Lock 3 Park in downtown Akron is the city's hub for entertainment. This outdoor amphitheater hosts live musical entertainment, festivals, and special events year-round. 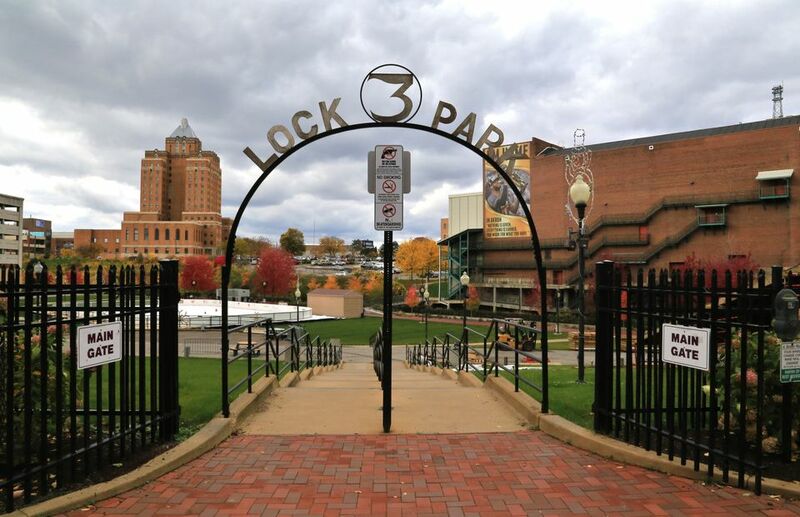 Lock 3 Park was created in the early 21st century to provide green space within the city of Akron. The Ohio-Erie canal can still be seen on the north side of the amphitheater. A boat yard and dry dock once existed at Lock 3 Park. Later, a pottery factory stood there until the O’Neil’s parking deck was built in the current location. The park has plenty of space to spread out a blanket to sit on or bring your lawn chairs. The paved walkways make it wheelchair and stroller accessible. The park has a capacity of 3,500 for concerts. More than 65,000 guests enjoy the recreation at Lock 3 Park annually. Lock 3 Live! provides a wide array of musical entertainment. There are concerts for almost every musical taste, including alternative, R&B, reggae, gospel, country, pop, jazz, and classic rock. The audio system is top-notch; any spot that you choose will be a good one. Video, audio, and cameras are not permitted at the shows. The park also hosts a number of festivals throughout the year, including barbecues, Soap Box Derby opening ceremonies, the National Hamburger Festival, firefighter competitions, charity events, tournaments, animal events and more. From November through February, Lock 3 Park is transformed into an outdoor ice-skating rink. Admission is free with skate rental for $3. Lessons are available and the rink may be rented for special events. Each event has food vendors. For themed events, there are coordinating foods available. Beverages, beer, and wine are also offered. You may pack your own picnics; however, alcoholic beverages and bottles are not permitted. Located in the O’Neil Commons area at Lock 3 Park is the Akron History Exhibit. This exhibit showcases the history of Akron and its successes. The Ohio & Erie Canal Corridor Coalition exhibit focuses on Akron’s early canal boating industry. Also on display are Dr. Benjamin Franklin Goodrich’s stand up desk and the Firestone Tire and Rubber Company’s non-skid tread design and tires. Akron was home to the father of the American toy industry, Samuel C. Dyke. His goal was to get marbles into the hands of every child, and those marbles are on display at Lock 3 Park. Many other items, photos, and Akron memorabilia are also displayed. The Akron History Exhibit is open during Lock 3 events and on Saturdays from 10 am to 1 pm. Admission is free. Performances are FREE on Friday evenings. Most Saturday concerts are $10 to $15 per person, and children under 48” are free. Event ticket prices vary. Tickets may be bought at the gate with cash only and gates open one hour before show time. The best parking is at O’Neils Deck, off of State Street -- check the official website for pricing information. Also available is Summit County Parking Deck off of High Street, Cascade Parking Deck off Quaker Street, and behind the AES Campus at 500 S. Main Street. Parking in all city-owned lots is free on weekends and after 6 pm on weekdays.